Still hectic over in this household, packing like mad and waiting on a date for the rewiring for the electric! In between all of that I've somehow managed to find time to read and sort out my bookshelves. Speaking of bookshelves, guess what I bought this week? BOOKCASES. I can't wait to put them up and make a huge post showing off my collection but sadly I have to wait until the work is finished so they're just sitting in boxes right now. So... not too many this week? I have to slow down on my book buying but I really don't want to! Great reads this week! I've been trying to read more sequels so I'm proud of myself for reading two. I do seem to average about 5 books read a week (I sold my soul to the Devil for a faster reading speed), so I guess the packing has slowed my reading down some. Quick Question: What's your favourite smell? The problem is there's just so many good books out there, it's hard not to buy them! I enjoyed Rooftoppers. It's quite a unique read! So you normally read 5 books a week?! That's awesome! XD that's my aim too. I've been averaging a bit more lately, just because I'm reading smaller books and trying to get through my tbr really fast so I'm not so overwhelmed. x) My Stacking the Shelves! 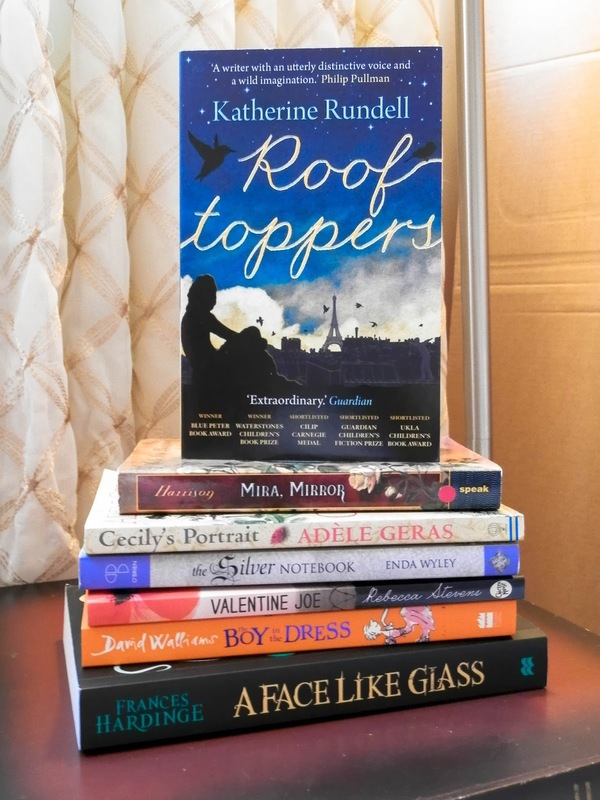 I finally read Rooftoppers this year, it's really lovely. Enjoy! I wish I could read more. Never seems like there's enough time. Awesome haul though. Great haul! Enjoy! Thanks for stopping by The Cover Contessa! A Face Like Glass! I love that book SO much. Enjoy! Ooh, I haven't read any of these. Hope you enjoy reading them all. OOh nice! These are all new to me! Hope you enjoy your new reads! Oh some wonderful covers! I hope you'll enjoy them all. Happy reading! Nice book haul! I haven't heard of any of them, but Rooftoppers looks really good! I've wanted to read Pirates Wish for a while now. Great haul! Valentine Joe looks very interesting. It leaves the mind open for a lot wondering! Yeah, I have trouble when it comes to getting new books to fill my shelves and my kindle with, too. Hopefully, I'll live a very long life so I will have time to read them all. My favorite smell is of tomatoes still on the plant. It is so yummy! Happy reading, Vickie, and thanks for stopping by this weekend. Oh, I cannot wait for you bookshelf post. I love peeking at other people's books! The Historical Houses series seems really interesting and I can't wait for A Face Like Glass. My favorite smell is freshly moved grass. Happy reading! Thanks for stopping by Becoming Books! A face like Glass sounds quite interesting. After seeing it now a couple times this week, it is a must for going on my TBR. I hope it is as good for you (if not better) than it sounds! Happy Reading!